Daniella Marie Collazo was always a perfectly normal and healthy child. I remember Mothers Day 2014, how my child was running all over the house and playing around as usual with her older brother Daniel. The following day I noticed she was very cranky and she just did not seem to feel very well and nothing would help console her, I figured it was nothing serious and that she would be fine. The next day it was much of the same, she was very cranky and non stop crying. As the day progressed I realized she did not want to walk and had no balance. Immediately realizing this I took her to Miami Children’s Hospital. Once we got to the emergency room and I explained the reason I brought her in, they immediately took her into the exam room. While in the emergency room the nurses and doctors noticed that she had dancing eyes also known as nystgamus along with a chill like shake. I remember being terrified doctors kept walking in and out of the room examining her. They took blood and urine samples to test. They also did a CT scan of the brain and all tests came back negative for any abnormality. The doctors decided they wanted to admit her for further observation. The next day they placed a foley catheter for a 24 hour urine test. This whole process for me terrible to have see my little 21 month old go through all these tests and not understanding why or what was happening. I was told the results for the 24 hour urine tests would take at least 2 weeks to be complete. On May 15, 2014 Dr. Naqvi a pediatric neurologist at MCH told us he suspected she was having a Post Viral Cerebellum Ataxia and that the symptoms should be disappearing soon. We were sent home on May 16, 2014. During the next few days she appeared to be improving but the Sunday before Memorial Day her symptoms worsened. We went back into the hospital on Tuesday following Memorial day, a spinal tap was done for confirmation to see if she was indeed having post viral cerebellum ataxia. When those tests showed nothing. Dr. Naqvi told us he wanted to do a full body CT scan to check for a culprit in the abdominal area. The following day we were told that the results were in and that the doctors would be speaking to us shortly. We were taken into a conference room and told that there was indeed a culprit in the abdominal area. An ultrasound was done to confirm that it was a mass. It was then confirmed that she had a mass on the left adrenal gland. Once this information was put together by all the physicians and the oncologist we were told that the ataxia was actually Opsoclonus Myoclonus Syndrome and that the mass on her adrenal gland is a Neuroblastoma the third most common cancer in children. At this point it felt as if life had stopped and time was at a standstill. We were told an MIBG scan would be needed for staging. Once the test was complete we met with the Oncologist she told us the devastating news that Daniella was a stage 3 with the primary tumor on the left adrenal gland and the local lymph nodes being affected. We were also informed that chemotherapy would be necessary to eliminate the cancer that was spread to the lymph nodes. On June 17, 2014 we went in for surgery, Dr. Ramos of MCH preformed a very successful surgery, the primary tumor was completely removed along with the adrenal gland. The same day of the surgery she also had a mediport placed in her chest for chemotherapy. During the surgery a bone marrow biopsy was also done to confirm that the cancer had not spread to the bone marrow. A couple of weeks later the histology showed that the tumor was high risk and unfavorable but was not amplified. Her tumor was also dividing at a very slow rate. We are now receiving chemotherapy treatment waiting for the day that we are blessed to hear no evidence of disease. We are hopeful that our baby will be cancer free. She received IVIG treatment for the ataxia that we were told had no cure. Remarkably after receiving the IVIG the OMS has completely disappeared and she is able to walk and be a normal child. Daniella story will continue as we will update periodically on the progression of her treatments. As the parents of Daniella Marie Collazo, we would like to personally thank Dr.Naqyi for the early detection that the OMS was being caused by the Neuroblastoma. Normal detection can take up to 3 months on a national average, and Daniella was diagnosed in 2 weeks. Daniella received 5 cycles of high risk protocol chemotherapy. During the middle of her treatment we were able to travel to the University of Chicago Comers Children Hospital for a second opinion with Dr. Susan Cohn. Dr. Cohn advised us that Daniella’s best chances to beat this disease would be by finishing the high risk protocol to its completion whether or not disease was present, which was the same opinion her oncologist Dr. Guillermo De Angulo had. Once her 5th cycle of chemotherapy was complete she had an MIBG scan. On December 17th 2014, Dr. De Angulo surprised us in our hospital room and informed us that Daniella’s scan was clean and that there was no more activity. This news came right on time as we were able to enjoy the holidays with our baby at home and celebrate the fact that we are winning the battle. On January 14, 2015, we went in for her stem cell transplant. During this time our baby had a Broviac put in to administer the high dose chemo needed for transplant. Daniella received 4 days straight of this chemo to condition her for the transplant. After resting for 3 days after chemo her stem cells were put back into her by Dr. Kamar Godder who is the BMT specialist and director at Miami Childrens Hospital. During her month long stay in the Bone Marrow Unit she experienced a very hard with mucositis, as we waited for her stem cells to graph. Finally her counts were well enough to go home. 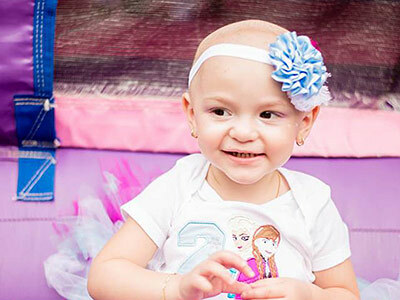 Daniella recovered from her transplant and completed radiation treatment as well as immunotherapy treatment. Daniella has completed treatment and all scans show no evidence of disease. Daniella’s port was removed. We would also like to thank all the Doctors involved in our Daughters treatment and all the amazing nursing staff in 3 North. We are also truly thankful for everyone that has prayed for our little girl, and the outpouring of love that so many have showed us. Dania Collazo and Jose Collazo Sr.